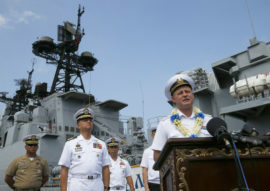 Culture | Russian Warships Arrive in Philippines as Manila Distances Itself From U.S.
Russian Warships Arrive in Philippines as Manila Distances Itself From U.S.
Three Russian ships docked in Manila, the Philippines for a five-day port call on Monday aimed at improving navy-to-navy relations amid heightened tensions in the South China Sea. The arrival of two anti-submarine ships Admiral Tributs and Admiral Vinogradov and a tanker ship is the sixth visit by the Russian navy under Philippine President Rodrigo Duterte who has distanced himself from treaty ally U.S. and sought closer ties with Russia. The Philippines and China have both laid claim to large portions of the South China Sea, with China building militarized artificial islands across the important shipping lane. The Russian warships will hold goodwill exercises including joint drills on navigation and communication as well as trainings with the Philippines’ quick response forces, the Philippine News Agency reported. The Russian visit comes in the middle of U.S.-Philippine military drills involving 7,500 troops that wrap up on April 12, according to CNN. Russia’s ships are scheduled to take part in joint naval drills with China in late April and early May after visiting several countries in the region, the state-run TASS news agency reported.